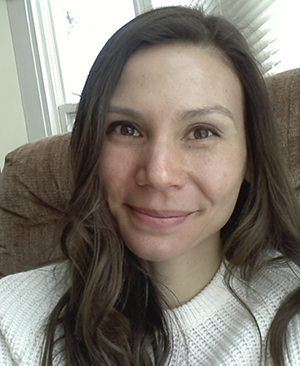 Medical anthropologist Natalie Porter will join Notre Dame’s Department of Anthropology as an assistant professor in fall 2015. As a researcher studying health and biosafety issues associated with human-animal interactions and laboratory experiments, Porter will bring a “distinctive and engaging” scholarly presence, said Professor Agustín Fuentes, chair of the department. Porter’s area of scholarly interest formed during the year she spent living in Vietnam prior to entering graduate school. Knowing extended periods abroad would be an essential part of studying anthropology, she chose to live in her mother’s native country. Later, as part of her Ph.D. research, Natalie traveled back to Vietnam, where she spent 15 months observing how global ideas about controlling disease in animals played out in a local setting. She observed the work of global health experts in the nation’s capital, lived on a chicken farm in a small northern village, and worked alongside state veterinarians implementing bird flu control measures. Vietnamese farm life was an informative and instructive experience, though not exactly glamorous. 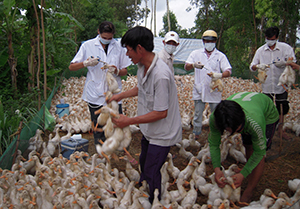 Natalie Porter (left) helping state veterinarians vaccinate ducks on a farm in southern Vietnam. Porter’s time there coincided with continued outbreaks of bird flu, giving her a chance to see firsthand how a foreign community responded to diseases in animals. Small-scale poultry farmers were selective in their incorporation of Western science—they embraced antibiotics and vaccines, but were also concerned about increasing costs for a typically inexpensive product to raise. When she returned home, she found that interest in multi-species studies was dramatically increasing throughout the social sciences and humanities. While earning her Ph.D. at the University of Wisconsin-Madison, Porter aimed to highlight contrasting political and social responses to pandemic disease threats. In the U.S., bird flu immediately raises questions about the health and safety of humans. But in a place like Vietnam, farmers and government officials are focused on stopping the disease at its source. Through her work, she also researched and reflected on the way disease threats are shaped by people’s interactions with animals—and how such biological scares raise questions about humans’ place in the world. Later, as a fellow at the University of Oxford, Porter began studying the way scientists work with viruses and other potentially dangerous biological agents. With science rapidly advancing to cope with pandemic disease threats, she said, researchers are often creating or working with specimens that can’t be classified—mutated viruses, genetically modified organisms, or entities with both human and animal parts. Porter studies the rules scientists establish to govern the handling and transportation of such specimens, as well as intellectual property and publication questions related to potentially dangerous experiments. Porter, who comes to Notre Dame from an assistant professor position at the University of New Hampshire, said though some scientists have been surprised by her desire to study their modes of operation, they’ve welcomed her presence.